Race record to date reads as 7 starts 0-0-1 FOUR 4ths and a 5th, for $8,050 in stakes and counting! Rarely gets beaten far and has shown over distances ranging from 1100m - 1600m, so she's very versatile. Worth noting though that she may be best freshened to shorter trips for now , then stepped up later, just a thought! Her sire Anacheeva is throwing horses that train on and improve with age, so in my opinion, that's appealing. You all know VICTORIAN form holds up and how well our maidens go in the right company, time after time again this formula works. 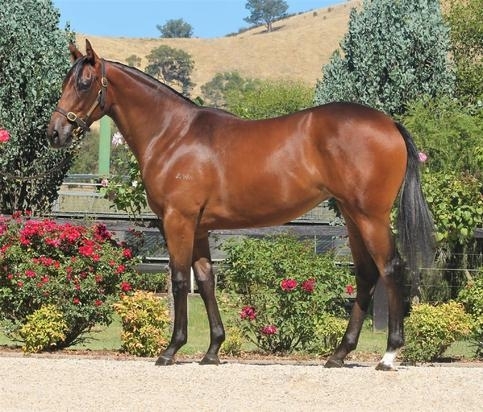 Boutique syndication company have given her time, but it's time t make way for a stack of yearling purchases, hence she's on the market to be SOLD! ANACHEEVA (AUS) (Bay 2007-Stud 2012). 4 wins-1 at 2, MRC Caulfield Guineas, Gr.1. Sire of 87 rnrs, 31 wnrs, inc. SW Ana Royale (SAJC South Australia Fillies Classic, Gr.3) and of Saucy Jack, Nice Kick, Clean Acheeva, Nacho Libre, Scappare, Segovia, Challicum, Heeza Force, Trerice, Framework, Kothu Rotti, Riverlea Honours, Southern Man, Special Rain, The Housemaid, Viva Acheeva, Anamovo, Ravage, Silver Way, Imanacheeva, Jackanna, Knut, O'Grace, etc. DALRADIAN (g. by Reward for Effort). 2 wins at 2, A$274,200, HK$48,300, MVRC Inglis Banner 2YO S., RL, 2d MRC Blue Sapphire S., Gr.3. O'Grace (f. by Anacheeva). 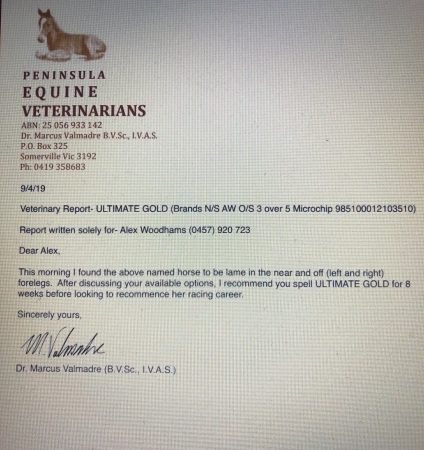 Winner at 1100m in 2017-18 in Aust. Ultimate Gold (f. by Anacheeva). See below. Launfal - Utmost Easy (H.K.) (Rudimentary). 2 wins-1 at 2-at 1000m, 1600m, HKJC Williams Cup, 2d HKJC Sing Woo H., 3d Goodwood Vintage S., Gr.3, Newmarket Superlative S., L, HKJC International Jockeys' Championship H., Kwai Hing H., Peony H., 4th Royal Ascot Coventry S., Gr.3. Lim's Blast. 2 wins at 1000m, 1100m to 2018, Singapore TC Class 4 H., 2d Singapore TC Class 3 H., 3d Singapore TC Class 4 H.
Flynn Effect. 2 wins at 1850m, 2000m in 2017-18 in Aust. Octennial. Winner at 2 in GB. Audubon. 4 wins to 1350m, QTC XXXX Gold Boxing Day H., BTC Uvex P., 2d BTC Spearkersandentertainers.com H., Cleandomain H.
Utrillo. 3 wins-2 at 2-at 1000m, 1100m, A$88,295, AJC Geoff Booth 2YO P., STC Beadman's Back 2YO H., Great Gear Supporters P., 2d VATC Geoff Murphy H., 3d AJC Tyrrells Wines H., NSW Tatt's RC Ray Balderston H., 4th Illawarra 2YO Classic, Gr.3. Guissola (Poet's Voice). 4 wins-2 at 2-to 1400m, A$76,750, to 2018-19, SCTC Coastline BMW 2YO H., 2d BRC Weddings H., 3d Qld Tatt's RC Winning Edge S., L.
Grand Britannia (Dash for Cash). 3 wins-1 at 2-at 1000m, 1200m, A$225,595, MRC Radio Sport 927 2YO P., 2d MRC Blue Diamond Preview (c&g), L, SAJC Jims Carpet Cleaning H., 3d VRC Sires' Produce S., Gr.2, MRC Vain S., L, Seppelt Wines H., 4th MRC Blue Diamond Prelude (c&g), Gr.3. PLATELET (Strategic). 10 wins to 1200m, A$1,396,250, SAJC Robert Sangster Classic, Gr.1, Goodwood H., Gr.1, VRC Gilgai S., Gr.2, MRC Thoroughbred Club S., Gr.3, Sir John Monash S., L, MVRC Tattsbet.com.au H., Dominant H., Jeep 55 Second Challenge Heat H., Essendon Mazda 55 Second Challenge Heat H., 2d SAJC Goodwood H., Gr.1, Robert Sangster Classic, Gr.1, MRC Schillaci S., Gr.2, MVRC Champagne S., Gr.3, Ian McEwen S., Gr.3, SAJC RN Irwin S., Gr.3-twice, MRC Seppelt Wines H., 3d VRC Cap d'Antibes S., L, MRC Heath S., L, VRC Taralye Deaf Kids Talking H., MRC Charter Keck Cramer H., Le Pine Funerals H., 4th MVRC Ian McEwen S., Gr.2.